Enter voucher code WATCHAFL20 below. Discount on first subscription payment only. All subsequent payments at full price. Cancel any time. New customers only. Offer ends midnight 28 April AEST. Subscribe now and start watching instantly. All 2019 AFL matches will be available LIVE and on demand. Watch AFL is a subscription-based international service that delivers LIVE streams and on demand replays of the Australian Football League to fans around the world. It can be purchased in or outside Australia from watchafl.com.au, however the content within the Service can only be viewed from outside Australia (for example, if you are living, working or holidaying outside of Australia). Watch AFL also gives you LIVE access to the 24/7 FOX FOOTY Channel for all of the latest AFL news, in-depth analysis and entertainment shows. You can change or upgrade your subscription anytime from your Account page. How does Watch AFL work? Once all of the four above are in place, you are able to connect and start enjoying Watch AFL. 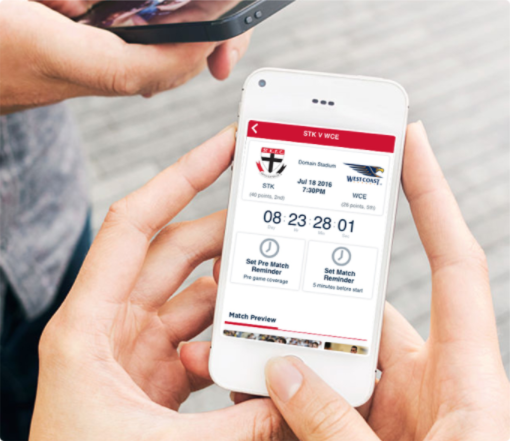 The companion Watch AFL apps are available on iOS and Android mobile and tablets. Also available with Airplay and Chromecast.